A team of scientists of the Max Planck Institute for the Structure and Dynamics of Matter (MPSD) at CFEL investigated optically-induced superconductivity in the alkali-doped fulleride K3C60 under high external pressures. This study allowed, on one hand, to uniquely assess the nature of the transient state as a superconducting phase. In addition, it unveiled the possibility to induce superconductivity in K3C60 at temperatures far above the -170 °C hypothesized previously, and rather all the way to room temperature. The paper by Cantaluppi et al has been published in the current issue of Nature Physics. Unlike ordinary metals, superconductors have the unique capability of transporting electrical currents without any loss. Nowadays, their technological application is hindered by their low operating temperature, which in the best case can reach -70 °C. Researchers of Andrea Cavalleri's group at MPSD have routinely used intense laser pulses to stimulate different classes of superconducting materials. Under specific conditions, they have detected evidences of superconductivity at unprecedented high temperatures, although this state persisted very shortly, just for a small fraction of a second. 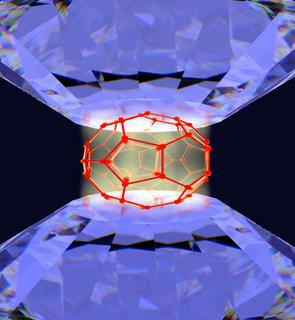 An important example is that of K3C60, an organic molecular solid formed by weakly-interacting C60 "buckyball" molecules (60 carbon atoms bond in the shape of a football), which is superconducting at equilibrium below a critical temperature of -250 °C. In 2016, Mitrano and coworkers at the MPSD discovered that tailored laser pulses, tuned to induce vibrations of the C60 molecules, can induce a short-lived, highly conducting state with properties identical to those of a superconductor, up to a temperature of at least -170 °C, far higher than the equilibrium critical temperature. In their most recent investigation, A. Cantaluppi, M. Buzzi and colleagues at MPSD in Hamburg went a decisive step further by monitoring the evolution of the light-induced state in K3C60 once external pressure was applied by a diamond anvil cell. At equilibrium, when pressure is applied, the C60 molecules in the potassium-doped fulleride are held closer to each other. This weakens the equilibrium superconducting state and significantly reduces the critical temperature. "Understanding whether the light-induced state found in K3C60 responds in the same way as the equilibrium superconductor is a key step towards uniquely determining the nature of this state and can provide new hints to unveil the physical mechanism behind light-induced high-temperature superconductivity", says Alice Cantaluppi. K3C60 was systematically investigated, in presence of photo-excitation, for pressures varying from ambient conditions up to 2.5 GPa, which corresponds to 25,000 times the atmospheric pressure. The authors measured a strong reduction in photo-conductivity with increasing pressure. Such behaviour is very different from that found in conventional metals, while it is fully compatible with the phenomenology of a superconductor, thus standing for a first unambiguous interpretation of the light-induced state in K3C60 as a transient superconducting phase. "Importantly", says Michele Buzzi, "we observed that for stronger optical excitations, we can obtain an incipient, transient superconductor at temperatures far above the -170 °C hypothesized previously, and rather all the way to room temperature". A universal picture able to describe the physical mechanism behind the phenomenon of light-induced high-temperature superconductivity in K3C60 is still missing and the ultimate goal of obtaining a stable room-temperature superconductor is not around the corner yet. 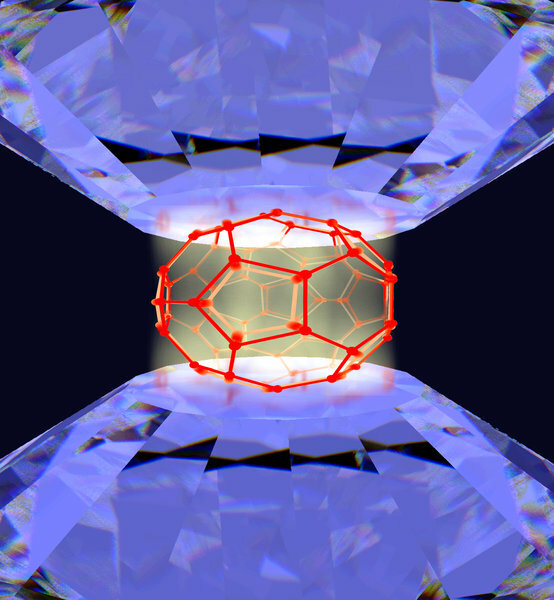 Nonetheless, the novel approach introduced by the MPSD team, which combines optical excitation with the application of other external stimuli, as external pressure or magnetic fields, shall pave the way in this direction, allowing for generation, control, and understanding of new phenomena in complex materials. This work was supported by the ERC Synergy Grant "Frontiers in Quantum Materials' Control"; (Q-MAC), the Hamburg Centre for Ultrafast Imaging (CUI), and the priority program SFB925 of the Deutsche Forschungsgemeinschaft. The experiments were performed in the laboratories of CFEL. The research was carried out in close collaboration with scientists of University of Parma and of the ELETTRA Synchrotron Facility, Trieste, Italy.